This week we have announced the Mesopartner Summer Academy 2016 on Territorial Economic Development. This year, the academy will have a special focus on green economic development in territories. The academy will take place from 4 to 6 July in Berlin, one of the most exciting capitals in Europe with a rich history of economic transition and development. I will be there an I hope to meet some of my readers as well. The annual Summer Academy of Mesopartner has become an important capacity-building event for economic development practitioners around the world. 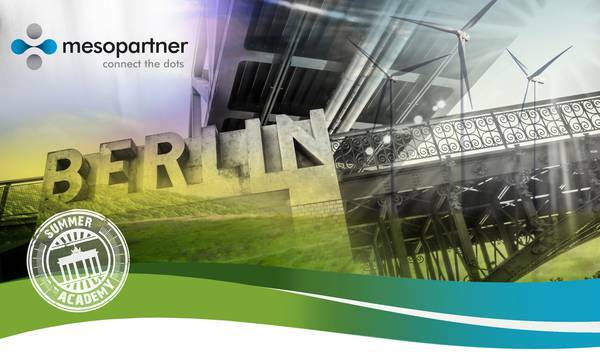 The 2016 event will be the 12th Summer Academy and the fifth to be held in Berlin. This year the theme of the Summer Academy will be Territorial Economic Development, with a specific emphasis on green economic development and climate change implications in territories. The event will draw on more than a decade of Mesopartner’s global experience in Local and Regional Economic Development (LRED), including the promotion of territorial innovation systems, clusters and value chains. However, it will address more than LRED and have a much stronger emphasis on integrating different priorities, perspectives and challenges faced by sub-national regions where industries, communities and government programmes co-evolve. This evolution of territories is complex and stakeholders face many uncertainties. Factors originating within the location, such as the demise of a key industry, interact with factors from beyond the locality like national or international shifts. A theme throughout this event will explore how to improve decision making in these uncertain environments. The event will focus on ways to assist local stakeholders to collaboratively explore alternatives while strengthening local institutional resilience. More information and details on how to register can be in the online brochure. This entry was posted in training and tagged green economic development, mesopartner, summer academy, territorial economic development on 17/02/2016 by Marcus.